The Neumann KH 870 is the legendary Microphone manufacturer's flagship Subwoofer. 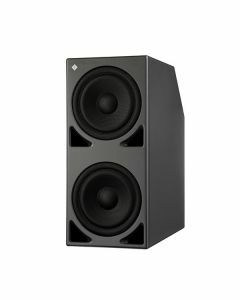 Designed to keep up with ever changing formats, the HD Bass Management system - compatible from Mono to 7.1, independent control of front and rear channels and system wide volume control found in the KH 870 means this subwoofer is perfect for high end studio situations now and in the future. The Neumann KH 870 subwoofer is built to accompany Neumann's vast array of monitors. Intended to be utilised in music, broadcast, and post production studios for tracking, mixing, and mastering, the Neumann KH 870 will leave you reeling from its power. The sub has the capacity to be run solo or daisy-chained, making it possible to construct larger systems with the possibility of higher SPL. The cabinet can be set up adjacent or flush mounted to a wall thanks to the front mounted port. The KH 870 also has the ability to be mixed freely in multichannel systems with other loudspeakers from the range.